Since I commute daily all year round my cycling season never stops. Longer rides, however, mostly don’t happen in winter. To open 2015 biking season I went with my friend John on a 2-day cycling tour during the Easter holiday. 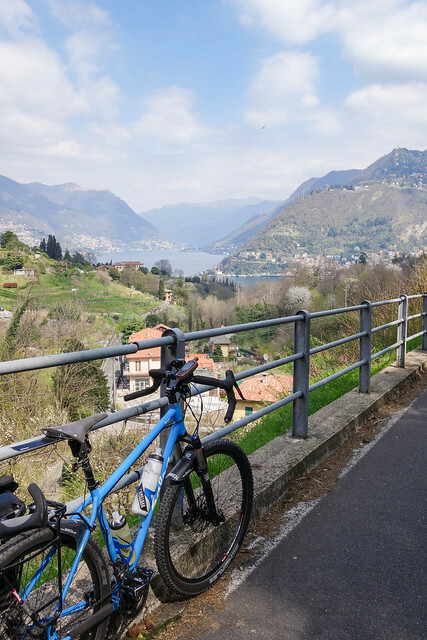 Because the weather forecast was predicting windy and rainy conditions in most of the Switzerland we decided to go south and ride along several lakes in Italy and Ticino. Preparations and planning went late into the night. The route went through ten or so iterations. Every time I started from scratch I thought I’ll never get it done. When John was already rightfully asleep I realized a major problem - all trains heading to our destination had their biking spots booked. Luckily, I could find a rental car in a nearby station. Woke up at 5:00. Everything was already packed and prepared for departure. At 5:30 I fetched the car from a nearby mobility station. I packed my bike into the car and headed home to have breakfast. At 8:00 I met John at the local train station. 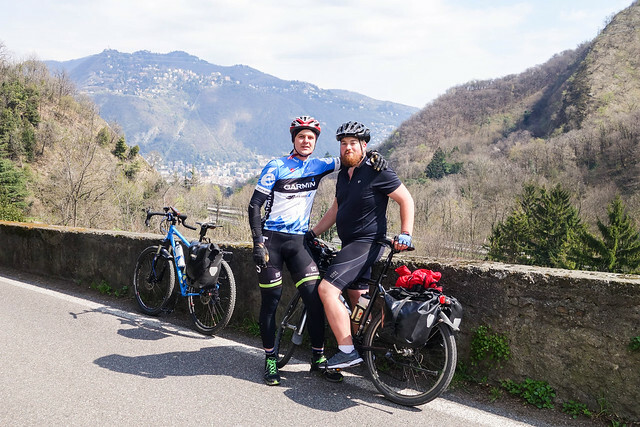 We packed his bike and bags and headed out to Bellinzona. The radio said there was a usual 10km traffic jam in the Gotthard tunnel so we decided to take a detour through San Bernadino. Retrospectively it was a good decision. In an hour the traffic jam extended to 20km. At 11:30 we ate a couple of sandwiches and had the bikes ready and the car parked by the Park and Ride at the train station. We made a mistake because the parking ended up costing 80 CHF. The right way to use P+R is to buy a parking card in advance. That’s possible through SBB ticket shop. 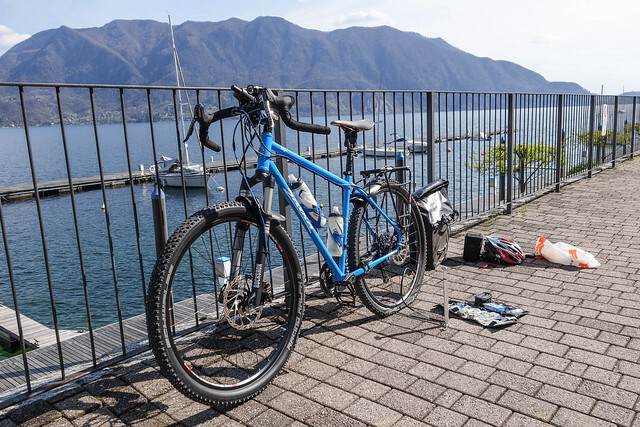 We rode through Ascona and before we followed the road along the lake Maggiore we took a scenic detour. It involved a short climb but rewarded us with a quiet road and scenic views. Once the detour ended we joined the road that goes along the lake. A lot has been said about the amount of traffic on this road. It is bad but the view of the lake makes up for it. We also inhaled a yearly dose of car exhaust. There are lots of voiced opinions about dangers of riding in Italian traffic. I believe this is not an issue if you ride defensively and mindfully. This means you don’t feel privileged on the road and you don’t always go as fast as you can. Instead, you pay attention to the other actors and anticipate moves and turns. I don’t mind waiting on traffic lights and not riding to the next car in front of me because I feel the driver does not see me. I also don’t mind breaking if I see that there’s a car making a maneuver. 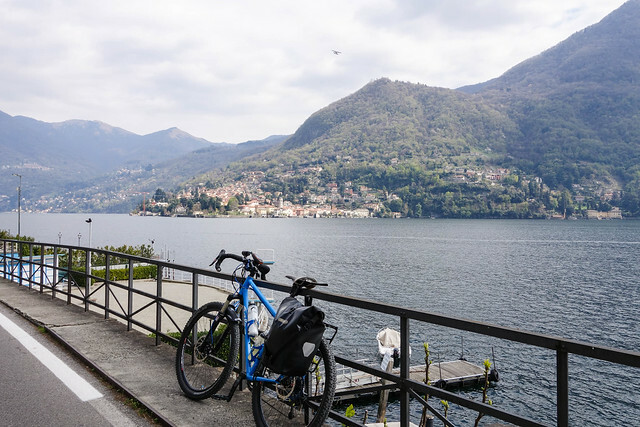 We rode until we got to a city called Verbania. 5km to Verbania I caught a flat tire, probably due to debris on the road. After a lunch in Verbania we took a ferry Intra-Levano. Don’t ask me why the ferry is not called Verbania-Levano. The road from Levano took us through typical Italian villages and relatively quiet roads. 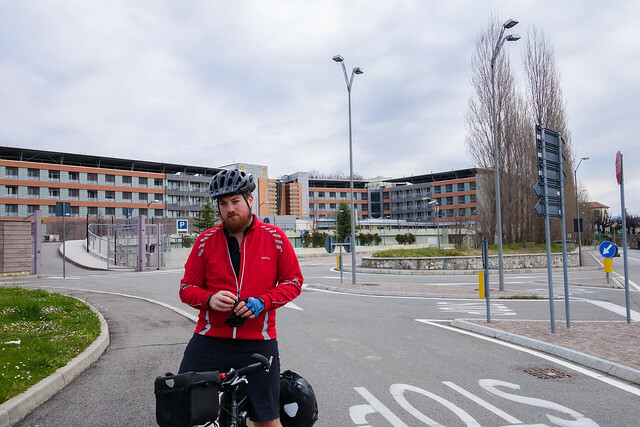 We continued along the lake Varese which has a nice cycling path along the perimeter. It reminded me of Bodensee. At about 21:00 we reached our 4-star hotel in Varese close to the hippodrome. The hotel reminded me of a Las Vegas resort. We arrived just in time to have dinner. The hotel staff was nice and let us keep our bikes in the storage room. We slept until 10:00 to compensate for the prior sleep deprivation. After having breakfast we left the hotel at about 11:30. First part of the route took us through relatively busy roads and several towns. Then we rode through narrow local windy roads. 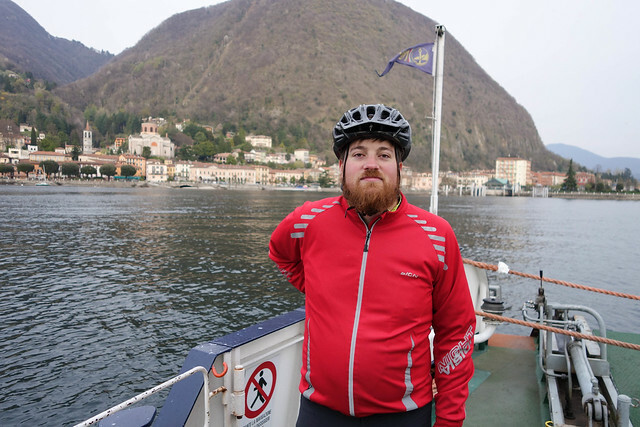 We then arrived in Como and continued along the lake. The road was much wider than the one along Maggiore and there was seemingly less traffic. In addition, there were long stretches of local roads that were almost free of cars. We had lunch in Mennagio. The road from Mennagio to Lugano involved a steady climb which quickly warmed us up from dropping temperature. 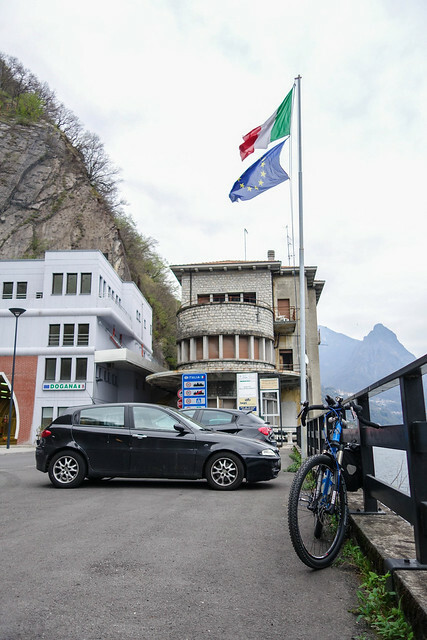 Crossing the Italian-Swiss border is apparently for cars only as the connecting tunnel is designed for motorized traffic. I’m not sure how are bicyclists and pedestrians are supposed to cross it. It was not that bad as it’s only 2km long. At 21:00 we arrived in Lugano. 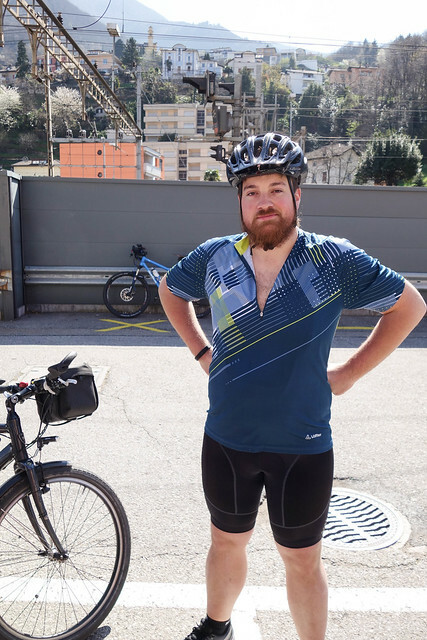 We biked the steep path from the city to the train station and hopped on a train to Bellinzona. In Bellinzona we loaded up our gear and went back through Gotthard tunnel. We arrived at 23:00 in the mobility parking station where we unloaded our gear and headed to Wadenswil train station. John took a train and I cycled back to my place. To avoid packing too much stuff into panniers I used just one bag. However, that makes the bike slightly unbalanced. Also, a full bag spoils aesthetics of the bike. Two bags is better. To my future self: pack one bag and then spread the load across two bags. Don’t start with two bags because that’s a recipe for taking too much gear. Despite few setbacks the tour went amazingly smooth. The ride was varied with different kinds of scenery and roads and we got to taste the region. I’m looking forward to more rides this year!